While fans and artists alike have taken to social media to reflect on the greatness of the late David Bowie, it’s also important to remember the moments when he spoke out on matters of race in the media. 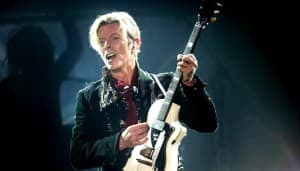 In various interviews throughout his career, Bowie challenged societal norms and shared his stances on issues like MTV’s earlier lack of the integration of black music and the controversies around interracial dating. We’ve shared some of the icon’s most memorable responses on race in America below. In 1982, David Bowie questioned MTV about not playing more black music on the network. The interview reportedly took place on air and was with MTV VJ Mark Goodman. Bowie readdressed MTV’s racism in a 1983 interview. Bowie was also one of the earliest supporters of the late R&B legend, Luther Vandross. Nile Rodgers wrote in his memoir that when the collaborators first met in 1982, Bowie explained to him that his English upbringing was responsible for his eclectic music taste. "We don't separate the music on the radio by race or by genre," Bowie told him. In 1993, he spoke about interracial relationships and his wife, black supermodel Iman, on the Arsenio Hall Show.